Prescription Safety Glasses is your online source for safety glasses and protective eyewear. All safety frames and lenses are OSHA approved and comply with ANSI Z87.1 standards. CRAZY 8'S MATT BLACK FRAME are ANSI Z87.1 Polycarbonate Lens. They're a great wrap around, stylish, comfortable and ligh weight for Extreme Sports. 100% UVA & UVB Rays and RX Ready. 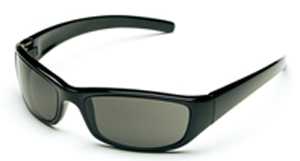 RX Available: The prescription lenses in Body Specs® are made of polycarbonate material. Polycarbonate is the safest most impact resistant prescription lenses available. It will be fabricated to exacting standards meeting Z87.1 safety lens, it will meet and exceed the drop-ball testing standard for such a lens. - Extra cost for prescription Lenses. - Price is without prescription. BLACK FRAME with strap 2.3mm Anti-Fog Lens. Prescription made into RX Insert. Extra cost for prescription lenses. Price is without prescription! •Now you can change all your lens without damaging your prescription. BSG-108 RX Gasket is an insert for your prescription behind the frame. Interchangeable Lenses and capable of a higher prescription (-5 to +5). The Insert fits TR-90 Megol Nylon Frame RX-Able. Ansi Z87.1 Compliant Lens, Interchangeable lens System, Anti-fog Coated, Adjustable Elastic Band, quick Release Push Button System. Pouch, Strap, Smoke-Green Lens with Black Frame plus 2 Extra lenses: Clear and Yellow or Lt. Rust. PRESCRIPTION LENSES: Prescription lens can be made for the Insert or for the frame without insert. Complete an order, then fax your prescription to 916-966-1223 or email attached prescription to RobertsEyewear@gmail.com.